Great photo on this sad occasion. 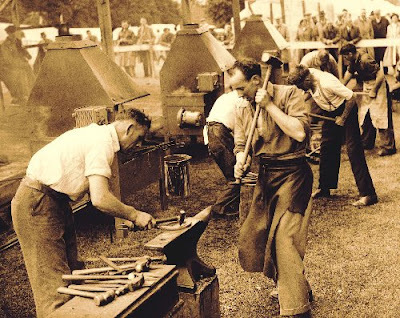 My father is on the third anvil with my grandfather. Edward,s passing leaves a great void in our hearts. Odd how things go. Was having a conversation the other day about how children in America grow up and migrate off somewhere. When I was in Scotland, Edward and myself and a friend were walking around the churchyard at Closeburn. His father was buried there and his father...and Edward was talking about his sense of place in the world. I had never thought about my own life in those terms of permanence or sort of belonging to some 'place.' Never forgot that. You're home Edward. Thank you so much for posting this photo. I remember seeing it at convention a few years ago and fell in love with it. Edward was a very special person to all who knew him.